The Outer Banks offers a treasure trove of activities for children and families. This beachside paradise is the perfect place for your family to create long lasting memories. Enjoy spending your mornings walking the beach and your evenings at any of the family friendly venues located all down the OBX. While some of the activities on our list are seasonal, many are available year round. 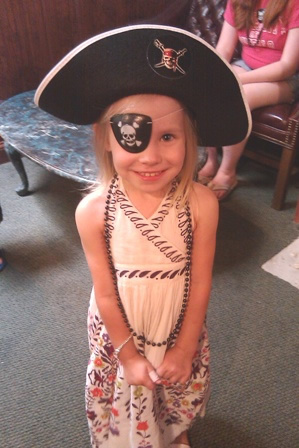 We've compiled a list of kid friendly activities on the OBX for you and your family to enjoy. We know the beach is the reason for the season but sometimes you need a little break from all that fun in the sun! Rev your engines! Ready to race? Speed down the straightaway and hug those curves at area raceways. Let your child become a professional race car driver for a thrilling time. Several area raceways offer multiple tracks, race cars, go carts, and even bumper cars. Some of these also offer arcade games, air hockey, and mini-golf. Wheel on over to a nearby race track. Driver's license not required. STAND FACE TO FACE WITH A SHARK! 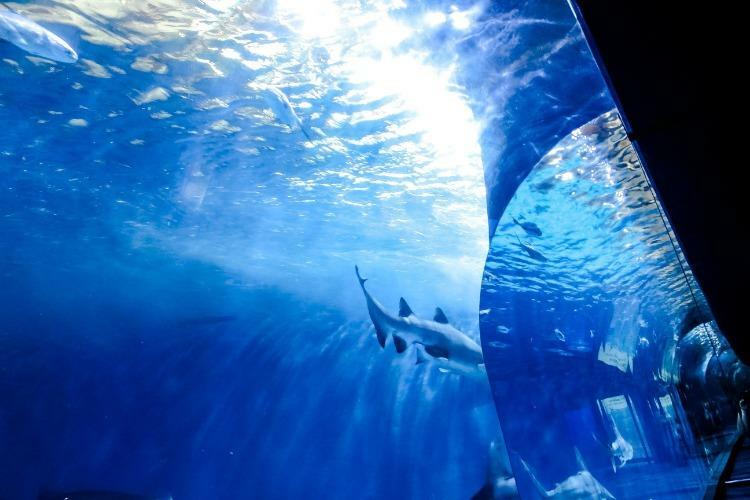 For those who prefer adventure under the sea, you must visit the North Carolina Aquarium. People of all ages who stand in front of the glass-walled aquarium eye to eye with sharks, sea turtles, and assorted fish, all have a child-like wonder on their faces. Children enjoy the pool where they can touch live sea creatures such as starfish and horseshoe crabs. There are numerous other interesting displays and interactive activities for the family. Take time to dig in the fossil pit - a found relic is a true treasure. This makes a wonderful excursion on a rainy day or when little ones have simply tired of the beach. Available year round in Manteo. A large variety of putt-putt golf courses are available for the aspiring golf pro. Select your lucky color golf ball, get the right length club, and then putt away! Most venues offer multiple courses with holes of varying challenge. It's sometimes hard to concentrate on your game when the cannons bellow from a nearby pirate ship, or giant dinosaurs stare at you from every direction (watch out for those teeth on the T-Rex! ), or strange aliens seem to come alive around you. Some of the sites offer more than just golf: ride through the mountains on a mining train, demonstrate your skill at arcades, or dig for treasure. Enough variety exists that you should plan to visit a different golf course each day. Save your score cards to track your progress during the week. Have a horse lover, or history buff, or nature enthusiast in your family? 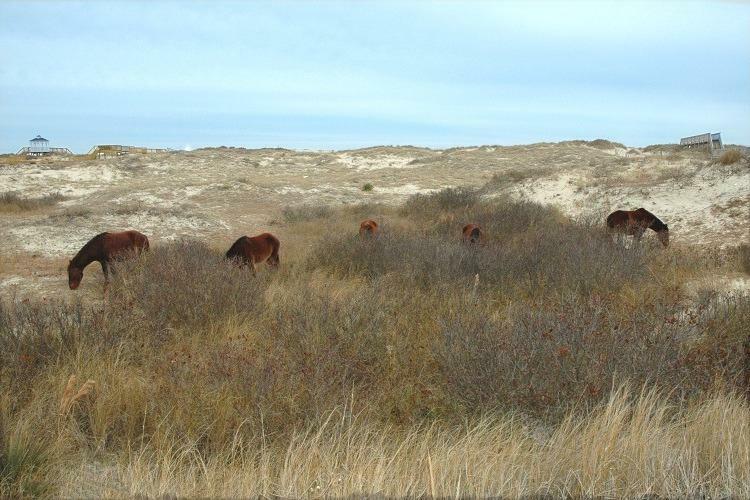 Plan a drive to the northern beaches and enjoy a 4x4 off-road cruise to view the famous wild mustangs in Corolla. Numerous companies offer tour packages some providing a tour guide to show you the way, some allowing you to drive out on your own. Be sure to take your camera for some fantastic photos. These wild ponies are descendants of horses first brought here in the 1500's! After your excursion through the dunes and along the beach, you should take time to visit the Corolla Wild Horse Museum. Here you can get close to a tamed pony, and children can participate in a variety of activities. Drive carefully, and be respectful of these famous Outer Banks natives! Bicycling is a popular past time on the Outer Banks. You can bring your own bikes, or you can rent bicycles from one of several bike shops and equipment rental companies on the island. While we we advise you not to bike along the Bypass (Hwy 158), pedaling along the bike paths on the Beach Road (NC 12) or Old Oregon Inlet Road is a nice way to experience the ambiance of our sea coast area while riding between ocean front and ocean facing properties. Serious bikers can travel up to 100 miles from one end of the barrier islands to the other with several opportunities to pull over and rest or enjoy the views along the way. For a slow-paced family ride without worries about vehicular traffic, park at the Wright Brothers Airport and enjoy the multi-use path that winds around the park area. Remember, ride right, wear a helmet, and watch out for sandy spots along paths and roadways. Whether you pedal for pleasure or performance, have lots of fun! Head back over the bridge with the family to Currituck for a time of dirty good fun at Dennis Anderson's Muddy MotorSports Park. Enjoy a wild time of hill-and-hole mud bogging; a variety of auto cross events, including dirty demolitions; sandy, sandy drag races; and incredible death defying stunts. Expect to laugh at humorous commentary, hold your breath at into-the-air jumps, gasp as vehicles almost disappear into mud holes, and cheer loudly as your favorite driver wheels across the finish line. The monster King Sling is the newest Anderson addition to the park; will it become your favorite mud runner? Concessions, music, and audience participation events will round out your adventure. Be sure to wear appropriate shoes and clothes - you will most likely take sand and mud home with you. If you have time, roll on down the road a ways, and tour Anderson's Digger's Dungeon. Have your picture taken as you stand beside a monster truck. Digger's Dungeon is home to the famous Monster Truck, Grave Digger. Frequently, in addition to Grave Digger, other monster trucks are on premises. A winner of a gift shop is also on site. 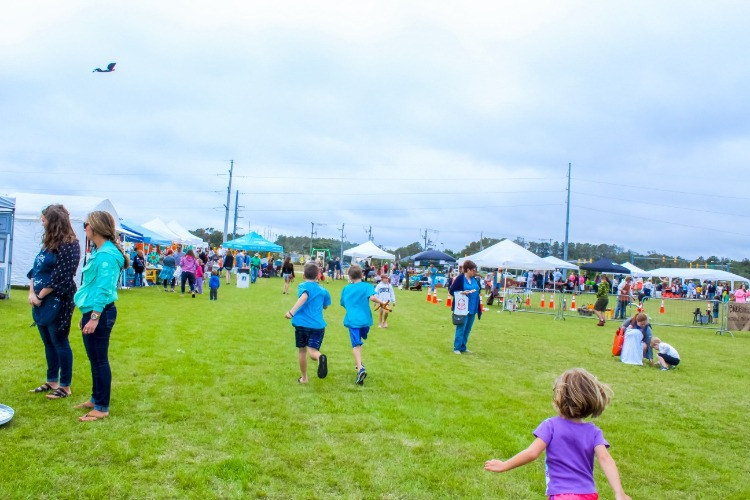 At the fun and educational Roanoke Island Festival Park visitors have the chance to experience life on the Outer Banks as it was in the 16th century. Instead of a strenuous hike, plan a leisurely stroll through the Elizabethan Gardens outside Manteo. Each season here has its own beauty since blooms and foliage grace the serene gardens year round. Have your picture taken as you stand beside one or more of the beautiful statues on the grounds. Meander around formal plantings reminiscent of the Queen Elizabeth era. This site is a memorial to those early pilgrims who made their way to Roanoke Island in the 1580s and then were “lost,” so as you meander through gardens, pause to remember those who first landed on this site so long ago. A variety of seasonal activities is hosted year round for kids of all ages, and a delightful gift shop offers you the chance to purchase a special memento of your vacation - maybe something for your garden back at home? Of course, you know about walking along the shoreline searching for treasures thrown up by the ocean. However, we also have many inland and sound side hiking spots where you can discover treasures of air, land, and sea. Alligator River National Wildlife Refuge Here, along well maintained walkways above wetland habitats, you may be lucky enough to spot an alligator, a black bear, or even a red wolf (saved from extinction, in part, due to efforts of this refuge). Of course, several species of birds and waterfowl are usually evident, and the naturalist in the family also will enjoy identifying trees, shrubs, and flowers. Nags Head Woods Trek along one of six hiking trails through this maritime forest and enjoy identifying rare plants, up to 50 species of birds, and a variety of reptiles, amphibians, and mammals.The trails vary in length and difficulty over hilly ground so choose the path that is best for you. To help protect this nature preserve please stay on the indicated trails during your hike. Dogs and bikes aren't allowed, but be sure to take your camera. Kitty Hawk Woods To hike through this coastal reserve you will journey along a multi-use path. In the marshy areas, watch for otters, muskrats, wading birds, and various reptiles and amphibians. In the deciduous forest you'll be likely to see deer, foxes, and other small animals; and, of course a variety of birds will serenade you along your hike. Below is a list of local playgrounds that will give you and your little beach buddy a chance to have some fun!